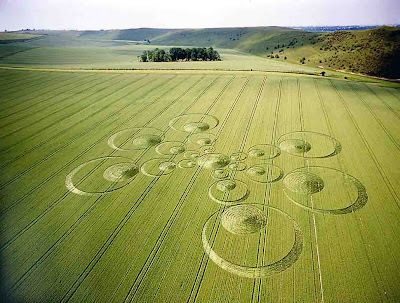 Ananka's Diary: Crop Circles: Who's Responsible? I can't believe I've been writing this blog for more than two years, and I haven't posted a single thing about crop circles! Several readers (thanks, Kitty!) have sent me some fabulous videos over the past few months. And now it's time to share my new-found knowledge with the masses. While I'll be the first to argue that Bigfoot is real, I've always been a bit skeptical of crop circles--the complicated, often beautiful, patterns that appear in fields around the world when no one is watching. (More than 12,000 have been discovered to date.) Are they made by fun-loving extraterrestrials? Or sneaky, math-loving hoaxters? Until recently I would have gone with the hoaxsters. After all, several have confessed in recent years. But after doing a little research, I discovered that the story might be more complicated than I assumed. According to Wikipedia, there are reports of similar phenomena dating back to the seventeenth century! (When people had far less time to pull pranks on their neighbors.) And some modern eyewitnesses claim to have seen flying saucers skipping across fields, leaving crop circles in their wake. So what do you think? Read the Wikipedia entry, watch a National Geographic video, and a MSNBC video, and write in with your opinion! But around the area were I live, I've hard stores of them. And because of GE close to us, we have unidentafied objects flying around all the time . . . you can even feel the viberations on the ground from them . . .
Maybe they're accidentally left by the UFO exhaust pipes! The UFOs can't come from outer space, though. There hasn't been any life out there since Chuck Norris's space trip! I'm reading a book on hoaxes right now, and it says that at least some of them are fake . . . I don't know but it really scares me. I don't think I'll be able to sleep. I haven't been on here in forever, but unfortunately all it seems to do is remind me how lame where I live is. I mean we have some of these things but goats on a farm just aren't that interesting compared to LA. and we don't have crop circles. AUUUUGH!!!! Does anyone have reccomendations on something interesting to do/see? You know what's really strange? I live like, really close to the countryside [take one turn and you'll be seeing cows and sheep]. BUT I NEVER SEE THIS KIND OF THINGS! No cow abduction or crop circles here!! Our cow milk's really good, plus, there are alot of BIG fields here! I once went on a rant about crop circles. I still believe it was the aliens. Think about this: The wheat or crop that has the pattern in it is only bent, not broken. At one point some guys confessed to a crop circle hoax but when asked to prove it, they couldn't just bend the stalks, they had to break them. i read that book! i just got it back from a friend. she kinda unreliable with that sort of stuff...but oh well. anyways i was surfing the web and i found a website for it. it's small but it's still cool. That's really awesome! 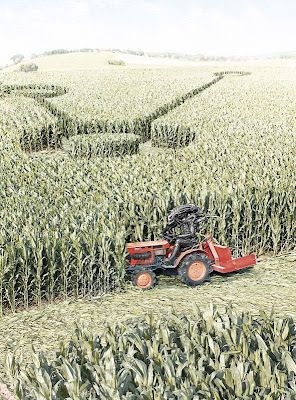 I had no idea that crop circles are real! That's amazing! I wonder, because if it was a hoax, they would need a lot of people, because if they were breaking the stalks it would take forever! They would never be able to do it in time! I know that aliens exist..... maybe these are just pranksters!!! Kitty: Have you been to China? if you have, have you tasted the milk? I would never want a huge back yard. So scary..
one of my friends did a speech on crop circles and had this really cool theory about freaky wind things! i think that they are hoaxes but her theory was really cool!